Belle is the latest version of the Symbian OS, bringing lots of improvements. That's why we have been happy to that Nokia has announced it will update a handful of pre-existing phones with it. Nokia's official Symbian Belle page has the update listed as "coming soon" to a handful of devices - the X7, E7, N8, E6, and Nokia 500. Previous information pointed to a 2011 release, however, a new tweet from Nokia UK has said that the update has been pushed back to "early next year". Symbian Belle (aka Symbian 10) is looking to put Symbian on par with other modern smartphone platforms by adding features that we've seen elsewhere. This includes: a pull-down taskbar/notification tray, live widgets in a variety of sizes, sharing via NFC, an upgraded web browser and an increased number of homescreens. 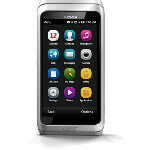 To see more details about it, please check out our Nokia 701 Review. No word on exactly when next year we should expect the update to start rolling out, but we'll let you know when we find out. They did say early 2012...which isn't that far away. As well, the N8 Belle OS has already shown up on Navifirm...so it looks to be just around the corner. Of course, I'll have to wait for Orange to release it...which takes at least another 4 weeks beyond Nokia's release schedule. Here in the US it will take even longer to hit, but I think it will be worth the wait. Next year is right around the corner. And Nokia has already released Belle handsets that have NFC functionality, long before most others, with the exception of the Nexus S 4g. Everyone else is just now releasing NFC capable handsets. I would be really pissed off but anna is quite good and these new effect from this smart chinese boy are great. Like someone said above..it's only ~20 days to the end of this year...I don't mind waiting:] I prefer it to be more polished and optimized.